When you grow up in a city and you have to leave your familiar streets, roads, stores all of a sudden it feels a radical change. I have grown up in Kolkata most part of my childhood and teenage have passed in the city of joy. And then I had to leave – first to Bangalore and then to a whole different country, to the United States. Its been almost 5 years since I left Kolkata, but there are still some little things that tend to draw me towards the undying city. Of course my folks are there and so there is a special bond. But, what am talking about is the dusty roads, the sweaty rickshaw wala, the continuous honking of buses and cars and of course the phuchka. While in Bangalore, I still used to get the cousin of phuchka – golgappa though they used mint paste and onions in the filling (which I hate). But, here in the US phuchka is a far off thing. The last time I went to my local grocery store, there was this plastic box of golgappas sitting at one corner of the aisle, and I just grabbed them. That evening was a nice one – a treat with phuchka, though they still missed something. My father would probably call that to be the sweat of the vendor and Kolkata’s dust. The other popular snack from the same phuchkawala is the alu kabli and churmur. 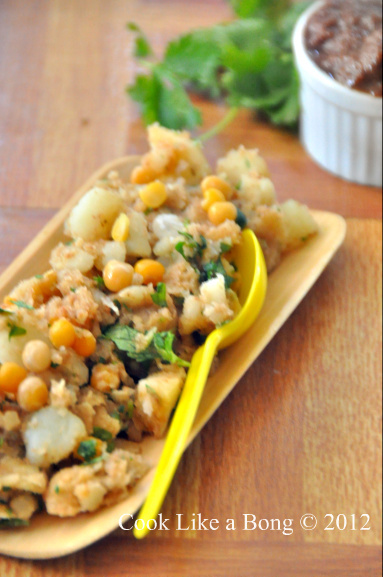 Alu kabli is the spicy hot and sour mixture of bite size boiled potatoes. Churmur is the broken down version of phuchka, or rather its a transition between alu kabli and phuchka. Share your phuchka story with us. Chokhe jol ar jive jol .. dutoi ese gelo … Left Kolkata and I am settled in Greater Noida. Those typical sweet fuchkas are available here .. they taste hell … This churmur recipe is like a dash of fresh wind .. dekhi fuchka kothao theke jogar korte pari ki na … Will definitely make this one !! debolina you can make the balls at home. Just make the dough with maida and suji, roll them like tiny luchi and deep fry. Even if they do not become puffed up its no problem as you need to crush them for churmur. Mukhe jol eshe gaelo je. And its dinnertime here. Enjoy your churmur.